Time truly flies when you’re having fun–and when you are busy. I apologize for the long delay between updates; it has been a very busy and productive last few months. I plan to post a lot of pictures, videos, and news in the coming weeks. As 2017 reaches the halfway point, I am repointing and refocusing my efforts on current research and writing projects, and fewer ghost investigations. Not that there is anything wrong with ghost hunting, but planning the investigations, the travel involved, and spending weeks reviewing evidence takes a LOT of time. And so does writing. Finding the time to investigate hauntings, research cases, and write books, all at once, and hoping for the proverbial “big bang,” is daunting at best. Any more ghost investigations? You betcha–but just not as frequently (for a while). It is now time to catch up on my writing projects. I have several works in progress, some of which are near completion. In my queue is a new, revised edition of “The Bell Witch: The Full Account,” a sequel to “Ghostly Cries From Dixie,” entitled, “More Ghostly Cries From Dixie,” and two new, first edition books: “The Outlaws and Ghosts of The Natchez Trace” and “From Turkey Creek – A Memoir.” The Natchez Trace book is in its early stages, and Turkey Creek is almost finished. You will be hearing much more about these titles, as well as release dates and upcoming appearances, through more frequent updates of this web site/blog. I will also be sharing pictures from various ghost investigations and my travels. In the meantime, I leave you with a video from a ghost investigation near Jackson, Tennessee, conducted on January 21, 2017. Three of us investigated an 1850s-era church building and Masonic hall, and the graveyard behind it, which dates back to the early 1820s. Activity was fast and furious, so much that we brought a much larger group for another investigation on June 24th; we encountered the same results. The area is chock full of history. Watch the video and read the captions for more information! Thanks for watching. See you soon! 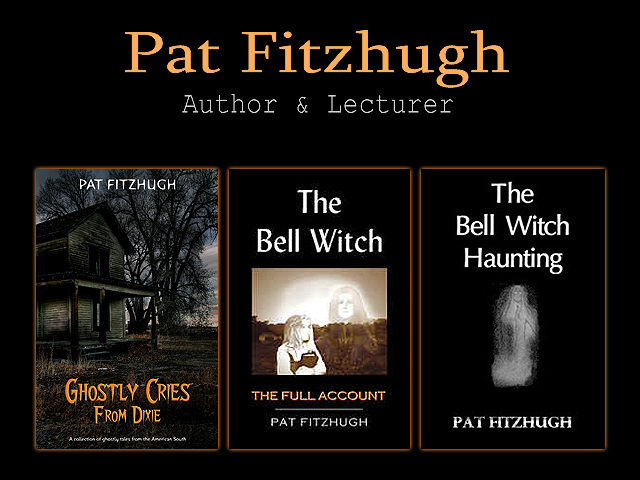 Posted in author, authors, Bell Witch, Books, creepy, Ghost Hunting, Haunted, legends, Paranormal, Paranormal Investigation, Scary, Spooky, Storytelling, Supernatural, Uncategorized, Writing and tagged folklore, ghost hunting, ghost stories, historical fiction, History, Jackson Tennessee, legends, paranormal investigation, southern, Writing on July 4, 2017 by Pat Fitzhugh.